If you’ve noticed that your balance isn’t quite what it used to be, or if you’ve experienced other vestibular symptoms such as dizziness or brain fog, you’re not alone. An estimated one out of every twenty Australian adults will experience dizziness or other vestibular symptoms at some point. While some vestibular decline is common with advanced age, dizziness and vertigo are not normal and should be treated. Dizziness and vertigo are not diagnoses, but symptoms that can have a variety of possible causes that can make vestibular symptoms difficult to diagnose and treat. These symptoms are often chronic and can be disturbing, but they don’t have to become a way of life. You’re probably aware that balance is controlled by the inner ear, but what you may not know is just how extensive the vestibular system is, or how many symptoms can arise from problems in this complex system. Vertigo and dizziness – Lightheadedness, sensations of being pulled in a certain direction, or sensations of spinning, rocking, floating that may occur in certain positions, with movement, or when still, or motion sickness. Balance difficulties – Stumbling, difficulty walking straight or turning, lack of coordination, difficulty with posture, need to look down or hold onto objects when standing, difficulty adapting to changes in ground surfaces, difficulty walking in low light, or pain in muscles or joints due to difficulties with balance. Visual disturbances – Trouble focusing on objects especially at a distance, tracking objects or reading, overstimulation in busy visual environments, sensitivity to light, particularly fluorescent lights or electronics. Auditory disturbances – Loss, distortion, or fluctuations in hearing, tinnitus (ringing in the ears or other sounds), sensitivity to loud. Cognitive difficulties – Difficulty concentrating, comprehension difficulties, especially in busy environments, forgetfulness, confusion. Other symptoms may include nausea, ear pain, headaches, or slurred speech. In addition, these symptoms can lead to loss of confidence and self-esteem, anxiety, social isolation, and depression. 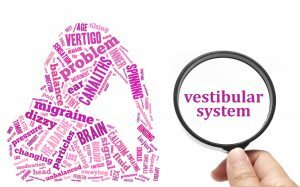 Vestibular symptoms can have a wide variety of possible causes, ranging from simple stress or dehydration, to more complicated neurological disorders or poor circulation. Effective treatment depends on accurate diagnosis, but balance problems are generally easily treated. Musculoskeletal misalignments – When we talk about chiropractic care, correcting misalignments is the first thing most people think of, though most people don’t think of misalignments as causing dizziness or balance issues. When one part of the body is out of alignment, the rest of the body tries to compensate, which can lead to pain and difficulties with balance. A chiropractor can help correct misalignments and recommend exercises to help you regain your balance. Calcium deposits in the inner ear – Tiny pieces of calcium can become trapped in the inner ear, where they can distort the signals between the brain and inner ear. Certain manoeuvers can help move the calcium deposits out of the inner ear where they can be dissolved. Nutritional deficiencies – In some cases, problems with dizziness and balance can be caused by dehydration or nutritional deficiencies. A dietitian can help you identify possible nutritional causes of your vestibular symptoms and ways to correct deficiencies. In some cases, vestibular symptoms may be caused by a combination of factors that may require a multifaceted treatment approach. At Chiropractic and Allied Health, we have experienced therapists in a variety of fields able to help create an individualized treatment plan to address your unique needs. To get help with balance or any other injuries you might be carrying, call one of our practices now.